22. The End Is Nigh! The Men Have One Of The Last Drinks At ‘The Sun Inn’ Eastwood Before!!!!!! This painting shows the town of Eastwood. As the revolutionaries marched up the hill to Eastwood, their numbers became fewer and fewer as deserters made a dash for it or slid behind hedges without being seen. Once in Eastwood they stopped at the Sun Inn, the landlady, a Mrs Godber begged Isaac Ludlam to leave the march and hide in her cellar. Hello, My name is Michael (known as Mick) Sharp, not only am I a husband but also father, grand-father and great grand-father. I am 72 years old and, have always been interested in painting (self taught) in an amateur way since boyhood. My other interests are brass bands. My father and his father before him also played with different bands in our area from Stanton Iron Works, where my father and I used to work, to my present day band Newmount brass from Derby. 23. Hussars move in for the arrests. 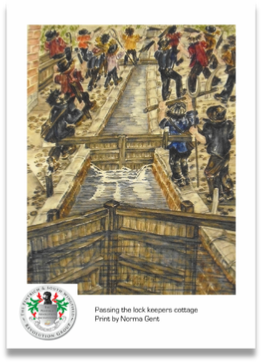 As the revolutionaries arrived at The Tanyard at Giltbrook, it was here that the Pentrich Revolution ended. For the leading marchers saw what they had always feared - soldiers. 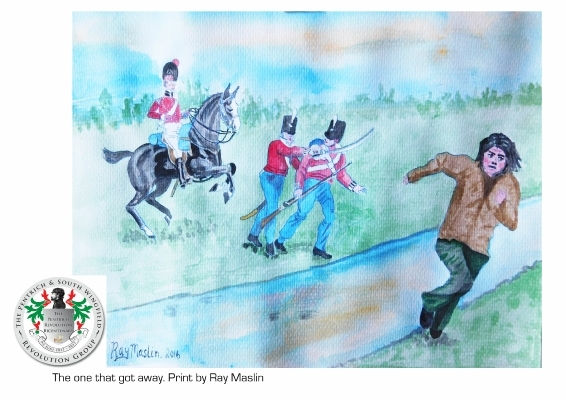 There were only eighteen mounted men of the 15th Regiment of Light Dragoons plus a sergeant and Captain Frederick Philipson, but the effect on the marchers was sensational, the revolutionaries at once began fleeing across the fields to the left and right, throwing their arms away and running to hide from the cavalry. Around 40 men were seized that morning. 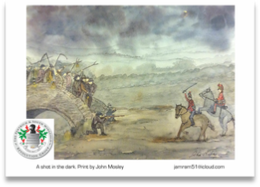 Pikes and guns littered the fields as the horsemen galloped after the fleeing marchers, other men were hunted down over the following weeks, the government knew well who had been instigated to rise, and so the revolution ended some twelve hours after it first began. After many years of painting landscapes I embarked on a Fine Art Degree course graduating in 2000 since then I have won awards for my paintings which have been included in major exhibitions in London, Birmingham and many local galleries. At university I was encouraged to 'loosen up' and work on a large scale and paint spontaneous atmospheric paintings which I found very liberating after many years of painting traditional landscapes. I enjoy painting big skies and remote beaches or moorland starting with a water colour sketch and photographs I then work in acrylic or oils sometimes working with mixed media, for the past eight years I have held water colour workshops on Saga cruise ships travelling to many parts of the world and meeting some amazing people who also enjoy painting. 24. Men waiting in Nottingham. 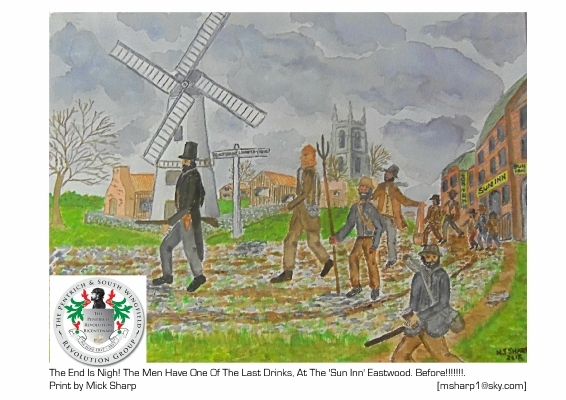 The Pentrich rebels believed that they were to meet up with thousands of others from across the Midlands and North, on the night of 10th June 1817, at the Forest. This was an area of common land and a racetrack just outside Nottingham. 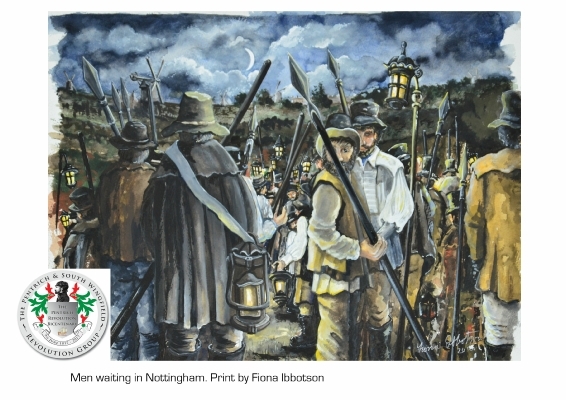 As it was, one witness at the Derby trial reported that there were no more than 100 Nottingham men assembled “two deep, with pikes and poles” and these were dispersed without violence. The authorities already knew that the uprising was planned. In fact, their own spies, such as “Oliver”, had been actively encouraging it. Soldiers and militia were already in place ready to attack the rebels before they reached the town. 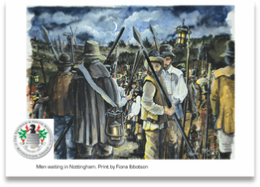 Hello, I painted this picture, number 25 of the revolutionaries meeting in Nottingham. 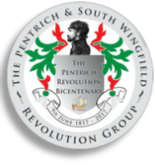 I have known the story of the Pentrich revolutionaries for most of my life, but I did not know all of the details. I am inspired by the men’s actions and feel that people who stand against inequalities and oppression. Deserve much admiration. 25. 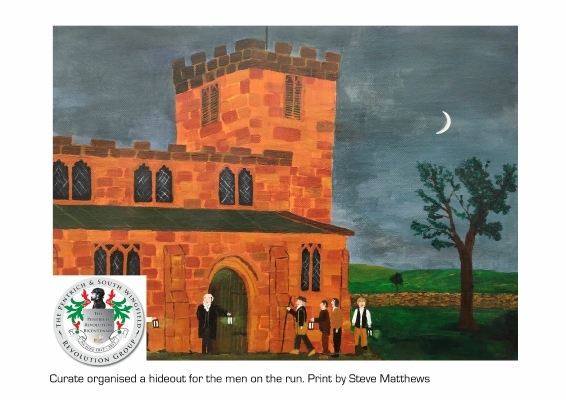 Curate organised a hideout for the men on the run. The curate for Pentrich at the time of the revolution was Hugh Wolstenholme. Hugh’s relative William Wolstenholme, was arrested prior to the revolution preventing a rising in the Sheffield area on 29th May. Both men were sympathisers to the uprising. 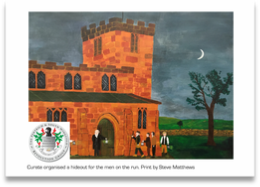 Hugh assisted by hiding men in the Pentrich Church bell tower, and then helped them escape. Hugh Wolstenholme eventually left Pentrich under much pressure and emigrated to America, where he continued to fight such injustices as the slave trade or the lack of education or the boys of America. He set up a small school and one of his first pupils was the then illiterate Andrew Johnson who would later become 17th President of the United States. When he grew tired of associating with so many people with whom he had little in common, Wolstenholme withdrew to far western North Carolina and built himself a small log cabin against the side of a precipice at the southern end of the Bald Mountain range and died there a hermit. Sympathiser Hugh Wolsltenholme was the curate at Pentrich church at the time of the revolution and supported what was going off at that time, he had just had his relation arrested for similar type of involvement in Sheffield. 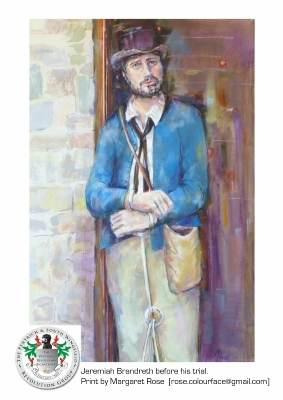 Hugh Wolsltenholme decided one way he could help was to hide men in various places around the village including the church. My wife bought me a drawing magazine Jan 2016 so thought I would have a go. So within 6 weeks I was asked if I could do this picture. Only painting I have done before this was painting model soldiers. 27. The one that got away. This painting represents the hamlet of Lower Hartshay. Miles Bacon was hidding in the hayloft near the vicarage, food being sent to him by the non conformist minister, when the troopers came into Pentrich. Miles made a run for it, heading down the steep hill towards Hartshay with soldiers hot on his tail. As he reached the canal, he cleared it and the towpath and continued running. He eventually arrived at a farmhouse in Whitwick in Leicestershire where a local farmer assisted him. The farmer's daughter would become his wife in 1821 and she would return to Derbyshire with him. Miles would have been around eighteen at the time he ran away. By the time he returned to Pentrich, his father, uncle and cousin had all been transported to Australia for their part in the revolution. On the 1841 census, Miles is reported as being born in Leicestershire as he also is on the 1851 census, by 1861 he must have felt safe enough to place Pentrich as his place of birth. Born in Shropshire at a tender age. I moved to Derbyshire in 1968, where I married a Belper lass. Now divorced and with two lovely daughters I live in Ripley. Born in 1947, I took retirement at 65. My career included labouring in a wood mill, an apprenticeship in a steel rollingmill, owning and running a fruit and veg shop in Ripley, operating an overhead crane at Butterley, managing a tyre depot, becoming an MOT examiner, and after a serious back problem-became a bus driver, then took on a catering business until retirement. For many years I have held an interest in painting. Most of my abilities are self taught and enjoy detail most of all. Subjects have ranged from classic cars to animals, landscapes to portraits and almost everything in between. 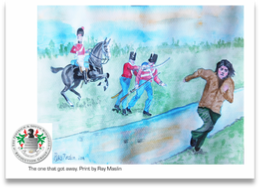 escape of Miles Bacon was quite a challenge as I had never painted a horse and rider before. I hope my efforts with “The One That Got Away” meets with approval. 30. Jeremiah Brandreth before his trial. "A general insurrection was supposed to have burst forth in June, but several of the Delegates were secured near Sheffield, and the others escaping warned their Towns, and neighbour-hoods from breaking out at that time; no notice however was given to the dis-affected part of our County, namely the Hundred of Scarsdale and that part of the County from Alfreton to Butterley,and Nottingham; they alone were bravely faithful to their Oaths, & wicked purposes; for they commenced the Rebellion precisely at the time appointed, headed by the noted Jeremiah Brandreth. They took the way to Nottingham, but before they reached it, they were opposed by the Troops, who took several of them, and dispersed the rest, though twice attempted to be rallied in front of the Dragoons by their brave Leader J. Brandreth, who was taken at Nottingham some time afterwards. A Special Commission was issued to try the Rebels at Derby in October, and four of the judges attended. Jerry Brandreth & three others were hanged & beheaded at Derby; several others were convicted, & several pleaded Guilty, who were transported. J. Brandreth was a man of the most undaunted courage and firmness, and possessed every talent and qualification for high enterprise. He was had been a framework knitter, & latterly a Sailor. He was 28 years old, of short stature, & very dark, with a very strong expression of countenance. He conducted himself extremely well upon his trial. The other Prisoners were common characters. Thus closed this most interesting year." This has been an unusual project for me. As a portrait artist I usually sit in front of the live person for whom I am painting a portrait. Obviously this could not be done for Jeremiah Brandreth. In order to make this painting I have used the black and white pencil sketch drawn in court on the day of the trial as a basis for the head and shoulders colour portrait that I have painted. I have used a colour illustration described as being from a newspaper of the time. I took this as a reference for his clothing but the work is my interpretation of Jeremiah coming out of prison into the daylight to be taken to court on the day of the trial. I wanted to portray him as concerned and worried about his fate but not bowed down. 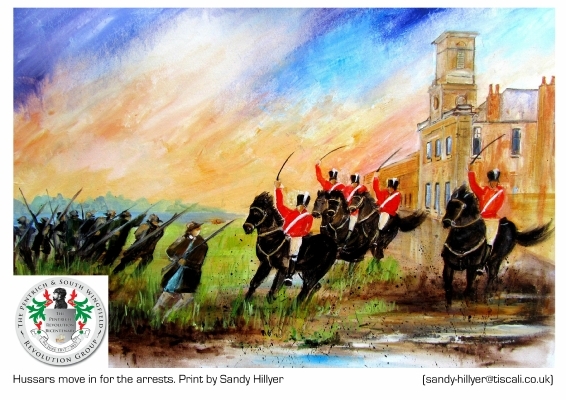 I am very happy to have my paintings included in this tremendous historical research project and to celebrate the 200 year anniversary of the events. Men from both the small village of Honley and the town of Huddersfield were both marching down towards Nottingham to meet the Pentrich men. The majority of marchers from Nottingham, Yorkshire and many other areas had been stopped from marching by the arrests of their organisers days prior, allowing only the Pentrich men and a few others to take arms and march; many arrests had taken place in Holmfirth and Sheffield prior to the march to prevent them from rising. The marchers from Huddersfield numbering some three hundred marched. 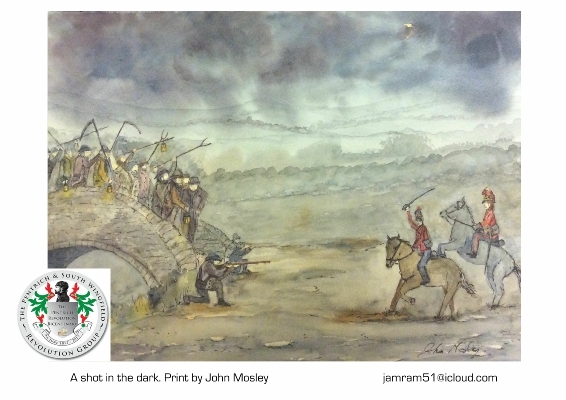 As two horsemen were spotted coming down Chapel Hill towards the rebels, the leader of the rebels ordered those with guns to kneel on each side of the road on the bridge, facing the town. 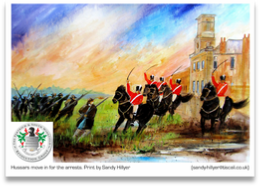 Captain Armitage, commander of the recently formed Huddersfield Yeomanry, a volunteer body of well-to-do merchants, manufacturers and tradesmen, had been alerted to the suspicious activities at Folly Hall. The first gun flashed in the pan, but failed to discharge and was followed by a ragged volley. One Yeomanry horse was injured with a wound to the head, but recovered, on Armitage's orders the party galloped back to the town. 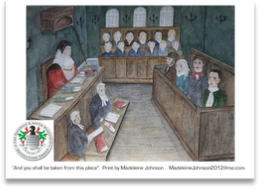 Due to the editor of Leeds Mercury revealing the work of Oliver the Spy at the time of their trial the Huddersfield men all were acquitted. John Allen Mosley I am a self taught artist I started painting about 10 years ago, but only in the last few years felt confident enough to show and sell my work. landscapes are my main subject but recently I have been painting animals in pastels. There were some forty men arrested on 10th June by the Hussars, while many more were arrested later. Men were held at both Derby and Nottingham jails. George Weightman was captured at the home of Hugh Wolstenholme's relative, William, who was already in prison and William’s two sons were also imprisoned. 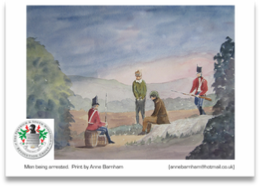 Jeremiah Brandreth eluded capture for some time. He twice tried to board ships to America unsuccessfully. He was eventually betrayed by Henry Sampson for the price on his head. 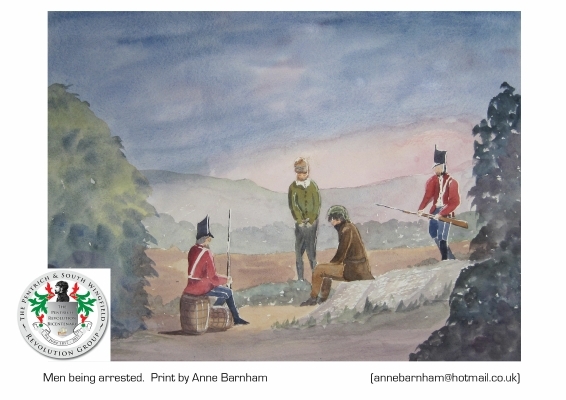 Sampson tricked him into his house were he was arrested by Constable Benjamin Barnes and four more men on 20 July 1817. Isaac Ludlam was tracked down in Uttoxeter, Staffordshire around the same time as Jeremiah Brandreth was arrested. The last two remaining men at large were the Bacon brothers, Thomas and John. They were finally arrested on 18th August in St Ives, Huntingdon after a reward of 100 guineas was placed on Thomas’s head. I started painting for a relaxing pastime but very soon became totally immersed. I went on workshops and painting courses with several different instructors so I now have a balanced view of the different aspects of watercolour painting. I admire the work of artists like Edward Wesson, Seago, Constable, Fletcher-Watson to name a few. Every Spring I go painting near Flatford Mill, where I can paint out doors in a variety of situations. Thames barges at Pin Mill, fields at Dedham and cottages and churches at many local villages. I really enjoy landscapes, the ‘big scene’ and water, but sometimes I like to have a building or structure of some kind to offset the gentleness or turbulence of nature. The contrast between tones and shapes with deep and clear colours is exciting and I try to convey this in my work. I teach at home in the studio and also visit Art Groups and Clubs doing demonstrations and workshops. Pen and wash, soluble ink, gouache and very wet in wet are some of the exciting atmospheric mediums that I enjoy. Please visit my web page, just put in Anne Barnham, Artist and I will be there! Teaching watercolour to a varied range of abilities on Cruise Liners is a wonderful way to spend retirement, we go to a great selection of interesting places! 21. Passing the lock keepers cottage. 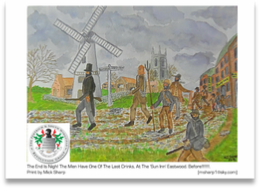 This artist's impression shows Langley Mill. On the 10 June 1817, at 6 a.m, the landlady of the Junction Navigation Inn, Mrs Ann Goodman, suddenly found herself confronted by several hundred thirsty men. They told her they meant no harm, were only sticking up for their rights and asked could they have some ale? The men had no sooner drunk their beer and set off in the direction of Nottingham when a group came back with a wounded man, Charles Walters. Mrs Goodman was informed that he had accidentally been shot and someone asked her to fetch a doctor. Another man then arrived – it was James Hill of South Wingfield – saying he felt faint because he was the man who’d done the shooting. He had been forced to carry a gun, he said, and it had gone off by mistake. Samuel Davenport, an Eastwood surgeon was called by George Weightman, who asked him to attend to Walters, nephew of George Turner. Davenport arrived at the place where the wounded man was lying with a wound in his thigh. Once Davenport found out that the men were taking part in a revolution, he hurried home without tending to the patient. James Turner rode back to Pentrich on Booth’s pony to fetch a cart to carry him home. Charles Walters did recover. Norma is a versatile artist with a wide range of subjects from pet portraits to scenes, from caricatures to family portraits with the odd tractor thrown in. Flowers are her speciality, Norma has been a professional artist for twenty five years and has exhibited at The Ideal Home exhibiton Derby, Erewash and Chesterfield museums and the BBC Artfile. She now shares her talent and teaches others her skills with watercolour classes and workshops on a regular basis. 29. “And you shall be taken from this place”. Of the forty five men to stand trial for their parts in the revolution, three were sentenced to be hanged, drawn and quartered (a sentence later commuted to hanged, drawn and beheaded by the Prince Regent), while fourteen men were transported to Australia, three for fourteen years and the remainder for life. 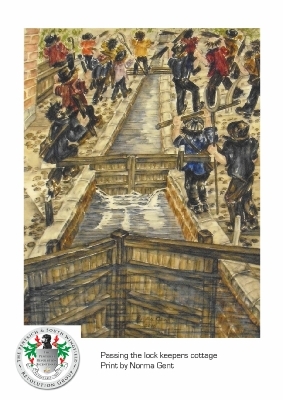 The trials started on 16th October 1817 at Derby Assizes, and the arrested men were tried not by their peers, but by predominantly rich landowners and farmers. At the beginning of the trial, it was decreed that no media publication would be allowed until after sentencing. This prevented anyone from coming forwards (as they did in the Huddersfield court case) and declaring the involvement of the government agent provocateur. John Moore was jailed for two years, Edward Moore and William Weightman were sentenced for one year, and William Hardwick, Alexander Johnson and Charles Swaine were jailed for six months. Twelve men were tried and freed, while eleven more were charged but not tried. I am an amateur artist working in watercolours at present. I enjoy particularly drawing and painting wildlife mostly from photographs and hope to develop this further. This was a new and interesting challenge to research and compose my piece for the courtroom scene. 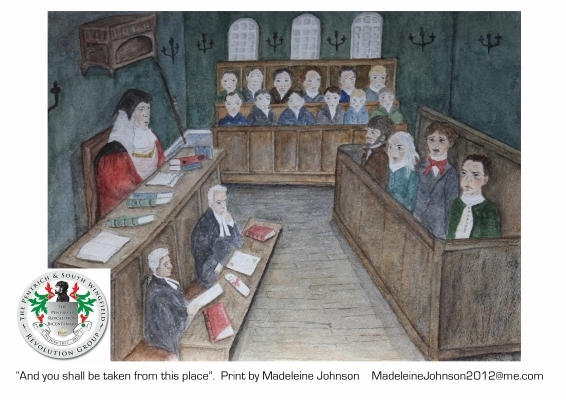 I decided on the courtroom scene because I am a solicitor, though now partly retired giving me more time to paint. I read that the Derby courthouse was re-arranged completely for the trial because there would be so many spectators and press. I didn't put the spectators in to keep it simple, so please viewer, imagine that you are sitting with the spectators who are looking down on the scene from your vantage point. I chose the moment where the Judge pronounced the death sentence on the four main convicted prisoners who are from left to right in the painting - Jeremiah Brandreth, Isaac Ludlam, George Weightman and William Turner. I used contemporary descriptions of them to try and get an idea of how they would look, as we only have the sketch of Jeremiah Brandreth and no drawings of the others. 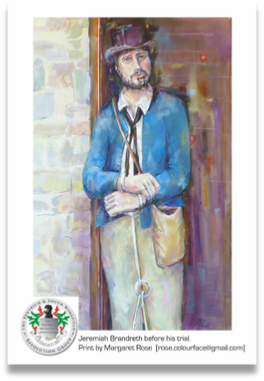 When drawing and painting the four prisoners I felt tremendous empathy with them and am glad to be able to be part of honouring their memory and that of their fellow revolutionaries. I moved to Derbyshire over 30 years ago to join family in the Belper and Ambergate area and I now live a few miles from Pentrich. It is a real privilege to be asked to contribute to this marvellous endeavour.